How did it go Simon? Thanks for the photos Simon, that's given me some ideas. I have glued an oil seal outside the block and machined a small section of the flywheel away so that if fits with over the seal with some clearance as it spins. This seems to be working at the moment. Yes, I think the back should be solid. I found I was getting a lot of oil leaking from there until I started filling the crank case to what I now think is the correct level. ie I was overfilling the crankcase. Simon - does your car leak oil where the crankshaft comes out of the front of the engine where the flywheel is? Cheers, Andrew. Congrats Buzz! Looks like a really nice car. I love the monocle windscreen. I think the Hup 20 compares pretty favourably with the Ford Model T (I've owned both). There is some good knowledge on this forum so if you have any questions when you start playing with it, someone should be able to help you out! Regards, Andrew. Hi Simon and David, Here are some photos I obtained from this forum when I was having a problem with my gearbox/clutch. My engine would slow down and stall when the clutch was depressed and on pull down, I found the thrust washers were missing. With the help of this forum, i had washers made up and now things work pretty well. Cheers, Andrew. Well done Phil - your car looks great! Did you have any issues with oil leaks? I find my Hup changes back to Low quite nicely using double clutching. Cheers, Andrew. Thanks Phil, David and Ken, I need to drop the top of my petcock tube a bit more to get exactly 3/4 inch. Looking at the diagram Ken, the top of the petcock tube is exactly in line with where the top of the oil scoop (bottom of big end) would be at the bottom of the stroke. It is interesting that the end of the big end bolt and nut "blocks" the oil scoop. When putting my motor together we thought about that and worried that the bolt would form a "groove" in the oil and the immediately following oil scoop may be running in that groove and not picking up enough oil. So we reversed the big end bolts so the oil scoop has clear access to the oil. Probably worrying about nothing. Cheers, Andrew. Paul, That is not bungee cord actually but something we in my part of Australia call "Paramatta Rope". It is woven blue and yellow rope with Blue and Yellow being the colours of the Paramatta Rugby League Club (Rugby League being a very popular sport on the eastern parts of Australia) - hence the name. It is very strong rope and while I would never advocate towing that load with only one or two points tied down, I would wager you could tow that a fair distance and it would never come off. Bernie, I have been silently following many of your restorations on this forum and am looking forward to seeing you to go to work on the Triumph! Cheers, Andrew. Yes, in my experience with the Hup 20, to try and drive with your hands on the wheel as shown in that beautiful poster is asking for trouble....lots of trouble! Hi Everyone, I thought some here might be interested in some pics of my Minerva engine when I had it apart recently (and one of engine in the car). Regards to all. Andrew. Hi All, I too was very sorry to learn of Edgar's passing. 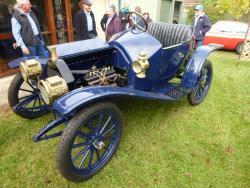 He was enthusiastic and very supportive when I obtained my Hupmobile and provided information and advice. I am attaching a couple of low res pics that Edgar sent me of the trip he did in his Model 20 from Gympie to Sydney and return (for non Australian's that is a considerable distance) - I suspect he sent them to me by way of encouragement as to the potential reliability and drive-ability of these vehicles ( I love all his luggage strapped to the fender / mudguard!). RIP Edgar and condolences to his friends and family. Regards to all, Andrew. That's great news Phil! I think if you blank off the bottom of the original manifold and then make up an adapter for the Holley NH that will give you the option of either carb without altering the manifold? I run a Holley but my car came with the manifold cut off. I had to make an adapter to fit the Holley as the bolt holes are slightly different. Cheers, Andrew. Hi Phil, My torpedo hasn't got a generator yet but I have a photo of the generator mounted on the other torpedo here in Australia. As you can see, the door would hit it. This car is a very early restoration (1950's). Looking closely at the photos, I think when rebuilding the body they didn't even put a door on the drivers side (can't see a hinge). This was the first car I ever drove (when about 10!) and also drove it 10 years ago. As most cars of that era are difficult to enter through the drivers side (due to brake and gear levers, spare tires etc.) I don't recall noticing that being unusual. This car also has what I believe to be an unusual feature for a torpedo in that the fuel (gas) cap protrudes through the body work so you don't have to lift the boot (trunk lid) to access. Here is a photo of another car which is not a torpedo but is similar in terms of scuttle and doors (but it doesn't have the rounded back - just an exposed fuel tank like the runabouts). I'm not sure what this body type is called. Again generator is mounted on drivers side running board - this car may not have a drivers side door either - I can't tell. The only period picture I have seen of a torpedo doesn't show any generator and I think the lighting shown may be electric? Another period photo - not a torpedo but it does have doors and again has the tower style carbide generator. Interestingly the style of front guards the car has allows the generator to be mounted well forward of the door but the horn tubing looks like it would prevent the door opening. Heres one without doors but showing a Prest-o-lite I would love to see some detailed pics of your torpedo - there don't seem to be too many around. Regards, Andrew.